Once neglected and algae-covered, this building at 32-36 Tacket Street embodies several lettering examples in its fabric. 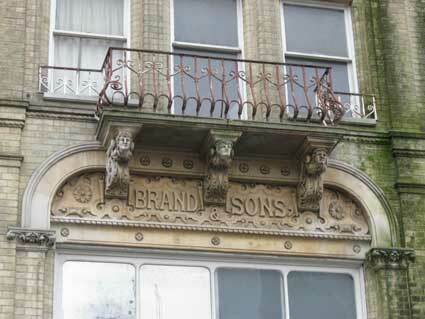 Part of the upper floors were once devoted to the First Floor night club; the shops below have changed hands many times, but once belonged to 'BRAND & SONS' as shown on the decorative panel below the ornate balcony. 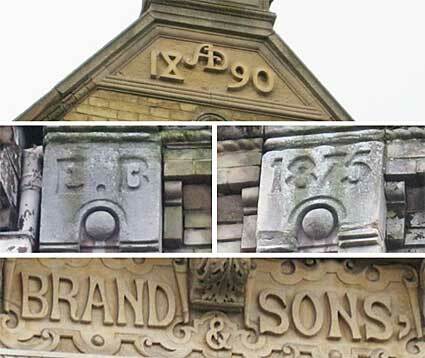 The supporting stone "brackets" supporting the balcony are a little like ship's prows with their human faces and the ampersand of the company name slides below the central one. Blocked gutters have caused staining, moss and algal growth. Below: Telamons up close and personal after the building was cleaned. 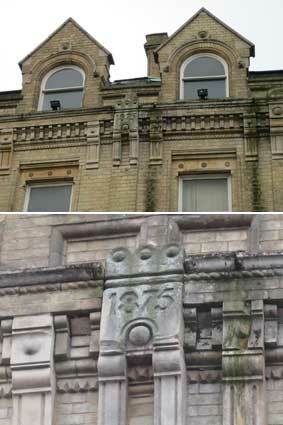 The eyes at extreme left and extreme right are particularly beady, perhaps due to erosion of the stonework. 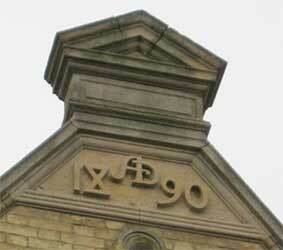 The capital stone at top left of the building adjacent to one which dates the fascade to 1875 - shows 'E.B' for E. Brand. The making of stays (corsets) was an important local industry for many years in Ipswich, the piecework manufacture being done in people's homes. In 1830 Ipswich had at least nine staymakers, six of them women, this rose to thirteen by 1845. At the beginning of the twentieth century there were only two women listed as corsetmakers, but three companies: the Atlas Corset Co. in Lower Orwell Street, E. Brand & Sons in Tacket Street and William Pretty & Son in the large factory with its high chimney on Tower Ramparts which employed hundreds of women. 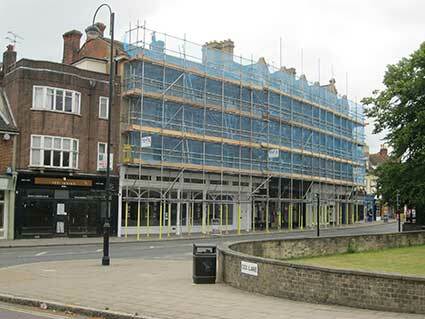 Pulled down in the eighties, this last site is now the public car park running behind Debenhams, All Fired Up (the stabling at the back of the Crown & Anchor Hotel) and Marks & Spencer. 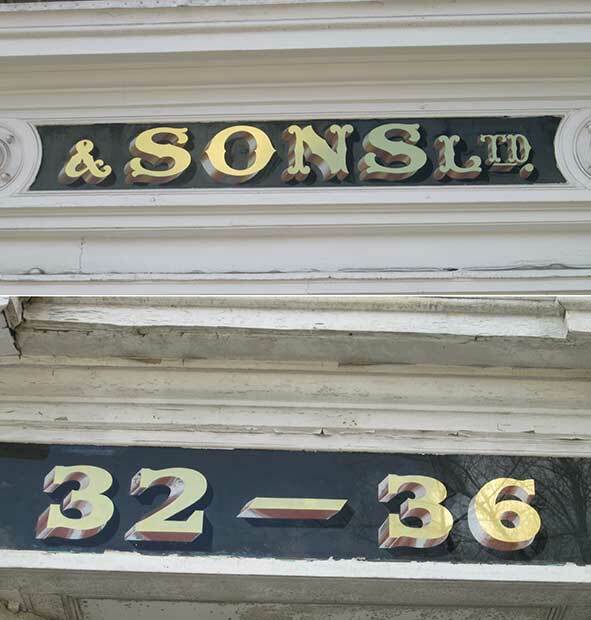 The rest of this signage above the shop windows is weathering at a slower pace, but there are traces of gold and black lettering showing through there, too. 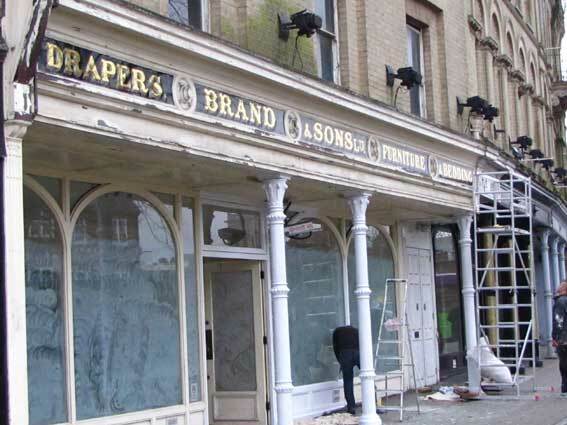 [UPDATE: 16.2.2015: "Walking along Tacket St today saw some fellas working on a shop frontage, has been wedding outfitters most recently, but they were standing with admiration looking at some of the most gorgeous lettering, in superb condition after they had scraped paint away. 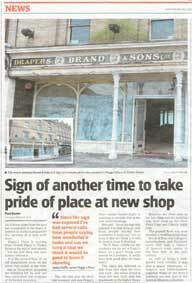 In the summer of 2016 this shop was vacated and stood empty once again. 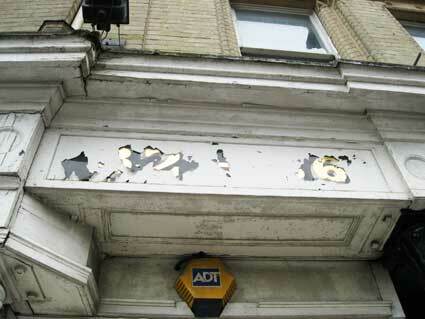 The resonant Brand & Sons Ltd sign remains, as it did for many years beneath coats of paint. 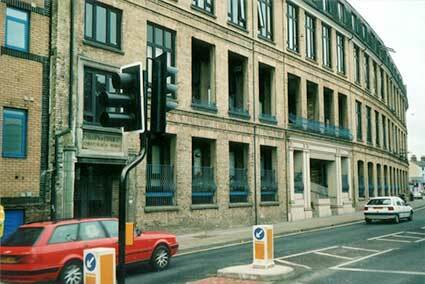 One hundred and thirty one years of history came to a close in June 1982, when Phillips and Piper closed its Ipswich clothing works. 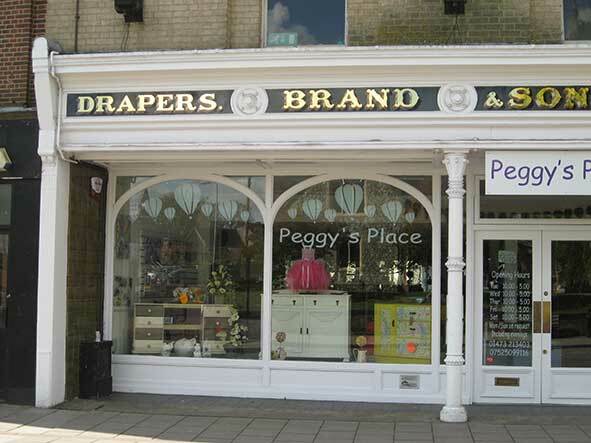 The company made high quality clothes, including riding wear for men, women and children. Thousands worked for the company during its history, many of them young women who started directly from school. Above: the deeply chiseled, stylish characters. It is only a short distance from Christchurch Mansion and Park; it's also halfway between Ewers Grey-Green (below) and The Milestone. 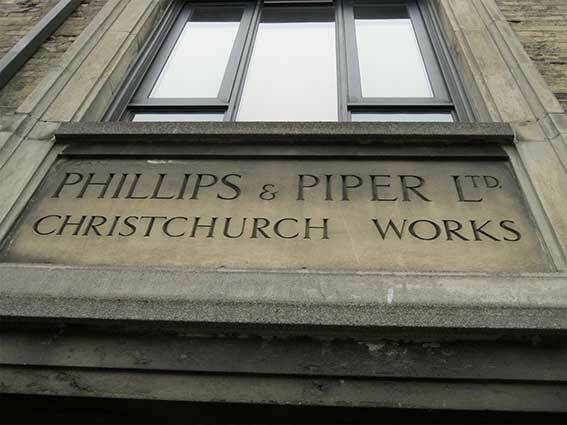 Above: Phillips & Piper Ltd.: No. 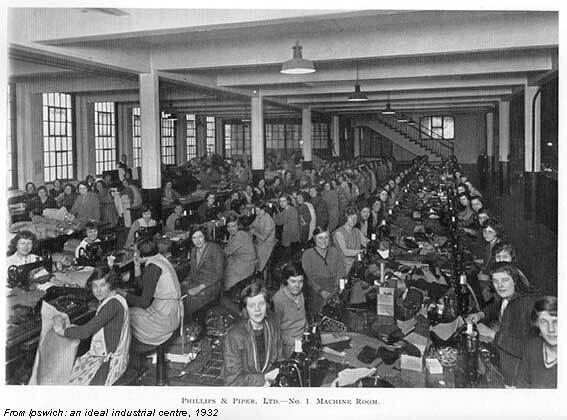 1 Machine Room – massed ranks of sewing machines and, almost exclusively, female workers. 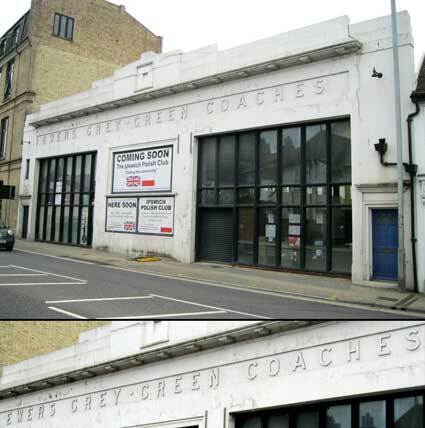 The former Grey-Green Coaches depot has large concertina doors onto both St Margaret's Street and Old Foundry Road. 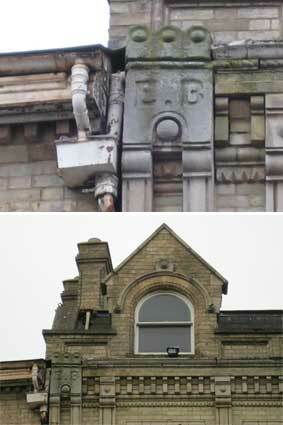 Below is the view from the Public Library's Lecture Hall entrance on Old Foundry Road; the front entrance carries similar lettering stretched in a single line. The modest art deco style of the building is well preserved. We can remember travelling in Grey-Green coaches from London to Saxmundham in the seventies and, amongst many pauses and stops, we pulled into this barn-like building as we paused in Ipswich (the coaches used to travel down all sorts of unsuitable roads in those days including a two-way Woodbridge Thoroughfare). These days the route is covered by National Express coaches which stop at the Old Cattle Market Bus Station. This spot would be far too congested with traffic most of the time to use the Grey-Green depot. 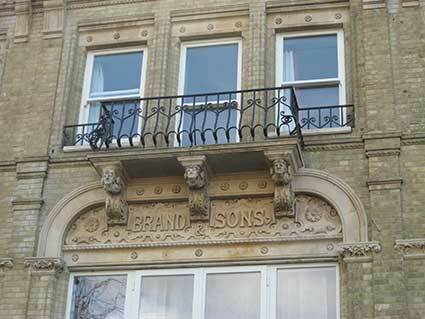 In recent years the building has been used by a taxi company, car dealer and auction house. The company was started in 1928 by George Ewers and ran express coaches from Ipswich and Felixstowe to London as well as coach outings in the famous 'Grey Greens'. After the coaches stopped coming through, seven lorryloads of ready-mixed cement were required to level the floor which dropped from St Margaret's Street to Old Foundry Road in order to facilitate water run-away when the coaches were washed. 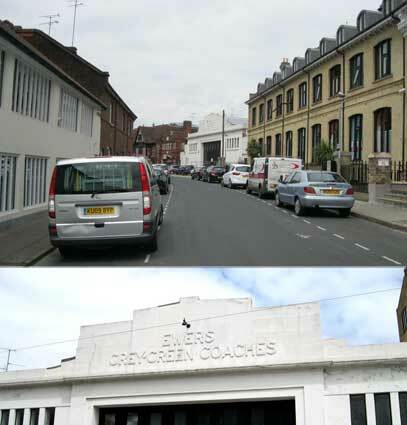 The Grey-Green Coaches garage is the 'properly Modern' work of versatile architect J.A. Sherman in 1937, who designed much hereabouts including the next door eclectic group on buildings including the former 'Bar Fontaine' and the Art Deco number 1 Woodbridge Road, dated '1928'. 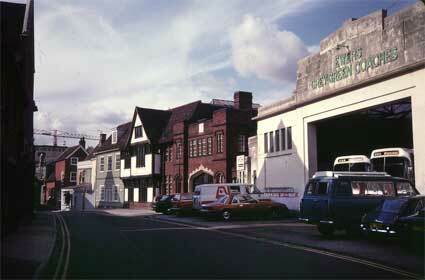 The photograph below shows the coach station when in operation in 1982, with the lettering picked out in green. 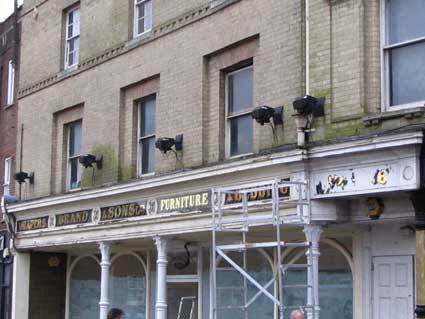 The crane in the background could well be being used to build Crown Pools in Crown Street at this time. In 2013 on a visit to the Ipswich Transport Museum we discovered a fine advertising board for Grey-Green Coaches. 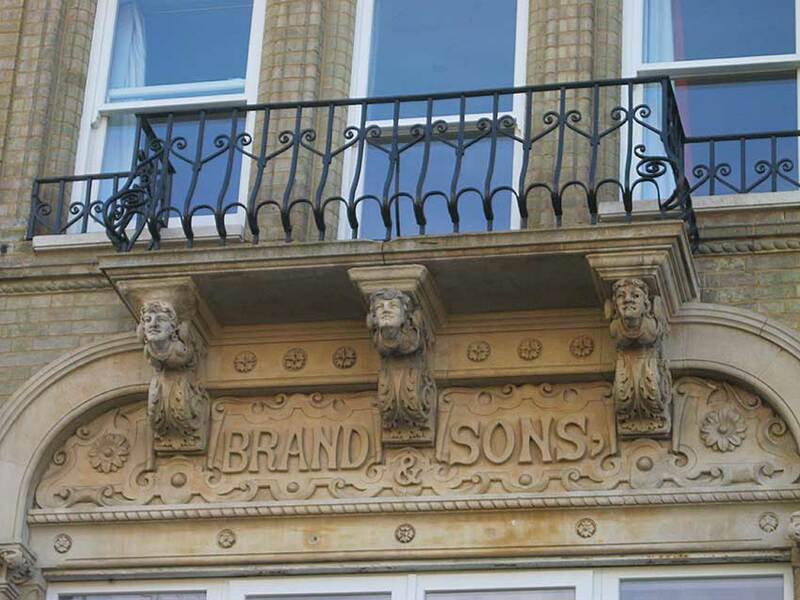 This part of the Ewers building stands on the historic Old Foundry Road (itself commemorating the original Robert Ransome foundry – see our blue plaques page – which was the start of the Ransome's engineering empire, so central to the history of Ipswich. 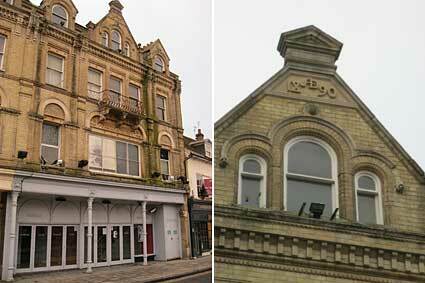 See also the last vestiges of the 'Ransomes' name in Wyke's Bishop Street and the Orwell Works site. 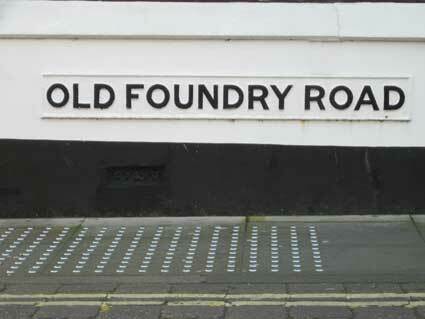 Old Foundry Road follows the line of the Rampart and Town Ditches round the medieval core of the town. Since a good repair and cleaning job in Spring 2004, the Ewers building presents a much crisper countenance to the world. 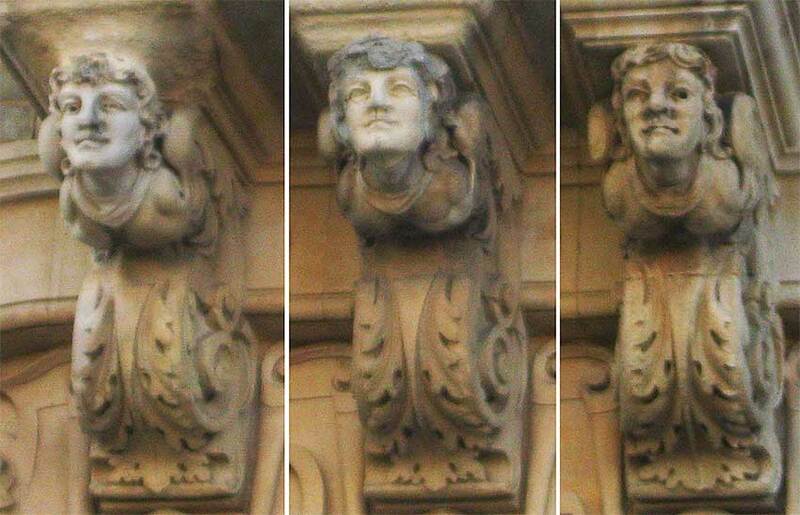 It faces the 'Lectures' entranceway to the old Central (now 'County') Library. See the 1778 map of the North Gate area on our Bethesda page.